We are now selling the popular La Hacienda Wildfire Firepit Grill at a brilliant price. Don't pass it over - purchase the La Hacienda Wildfire Firepit Grill here now! La Hacienda Wildfire Steel Firepit / Firebowl & BBQ - Bronze (58116) La Hacienda Wildfire Firepit - this steel firepit sits off the ground on three tubular legs. Unlike other firepits, the Wildfire firepit has mesh sides with a decorative flame effect pattern running around the edge allowing you a greater view of the fire inside. 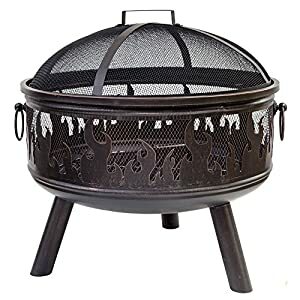 The Wildfire also has a domed sparkguard top which is particularly helpful if you are using crackling logs as it will help prevent sparks from flying out of the firepit. 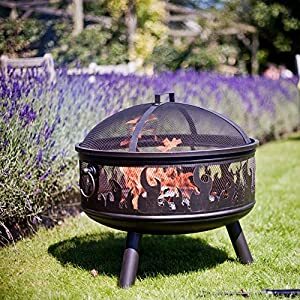 Firepits and fire bowls will usually compliment any patio or decking area, regardless of if it's a traditional or contemporary style.